Good news seems rather scarce of late, but we’ve got some that’s really great! Proximity Hotel and Print Works Bistro are the first in the hospitality business to earn the U.S. Green Building Council’s highest rating, Platinum! It is also great news that our focus on local food and extraordinary flavor has resulted in the best tasting food yet at Lucky 32, Green Valley Grill and Print Works Bistro. Read on and you’ll get more news about all of that and the good stuff that we have cooked up for the holidays. Rambling: Platinum for Proximity Hotel & Print Works Bistro! LUCKY 32 IN GREENSBORO & CARY: Executive Chef Jay Pierce is taking this Locavore thing to a whole new level of freshness by sometimes serving veggies grown by Mark Schicker, a server at Lucky’s! Mark has provided eggplant, cucumbers, cherry tomatoes, kohlrabi and okra. We are looking forward to his turnip greens, beets and kale in the coming weeks. In the continuing evolution of Lucky 32, we are thrilled with the flavors coming from Jay’s culinary leadership. His focus on upscale, down-home cuisine is resulting in astonishingly flavorful food. But he hasn’t lost touch with the fact that Lucky’s built its reputation over these past 19 years by not only being great, but also by being a great value. The prices are still very reasonable, especially when you consider the quality of the food he buys and the professionalism of the culinarians that cook it! The new fall menu still has many of Lucky’s legacy recipes plus selections that are updates on classic southern dishes. Southern pantry staples (like sorghum, sweet potatoes and collard greens) and all-natural offerings (like catfish, beef, pork and chicken) let Jay pull off his “contemporary take on home cooking.”Now that the weather is getting colder, he’s throwing even bolder flavors your way. The new fall menu includes the return of Brunswick stew, Lucky’s almost famous chili, braised pork shank, and house smoked pulled pork with johnny cakes. See more at lucky32.com. We are lucky that newlywed Shane Garrity leads the team in Cary and that Karen Walker does the same in Greensboro. They are both extraordinary people who bust their cans to take great care of their guests and staff members! If you ever need anything, email or call them and you’ll see what I mean: Shane at sgarrity@qwrh.com or 919-233-1632, Karen at kwalker@qwrh.com or 336-370-0707. GREEN VALLEY GRILL: Wine Director Julia Warren Schiavone (who has gained the impressive handle of “Advanced Sommelier” by the Court of Master Sommeliers) has greatly expanded our wine offerings. We now have more than 600 carefully chosen selections, with 75 by the glass! We also have a lot of verticals (same wines from consecutive vintages) from well known California and Italian producers. Plus, there is special attention paid to outstanding wines from less recognized varietals or areas. (Often these represent some of the best values.) We even offer “wine flights” that give you tastes of four different wines. Julia also collaborated with bartender extraordinaire, Mark Weddle, to develop some extraordinary specialty martinis. Each evening, Chef Leigh Hesling is now cooking a wood-fired rotisserie special. Every Saturday, it’s prime rib that is rubbed with a rosemary seasoning blend and rotated slowly over a white oak fire… pretty tasty stuff. Other evenings he rotates the rotisserie special between pork, lamb, beef tenderloin and chicken. His current menu includes the return of the popular peasant chicken salad, ham & brie croissant, paella, and veal jägerschnitzel. The parmesan crusted chicken continues to be Chef Hesling’s most popular recipe. He has also added a new dessert sampler that includes the apple crostata, nutty Irishman cake, vanilla bean crème brûlée and the featured dessert of the month. Pour over our entire wine list and all the menus at greenvalleygrill.com. you get to enjoy a multicourse meal and sip wine paired by Julia. There will be four classes over the next year, with the first in January. Visit printworksbistro.comfor specific dates. Tickets for the entire series are available and make a great holiday gift. Reservations required, so contact Lee Healy at lhealy@qwrh.com or 336-478-9126. • November 20: Beaujolais Nouveau est arrive! This will be fun! We’ll have the first of the 2008 vintage, which will be just days old, matched with traditional offerings that celebrate the harvest. • Family-Style Dinners, November 28th, 29th and 30th: In addition to our regular menu, we will serve Beef Stroganoff, Coq Au Vin and Fresh Fish Meuniere family style. Enjoy the fellowship of Thanksgiving with friends and family through the weekend! Turkey-to-Go:Enjoy Green Valley Grill’s wonderful cooking with Thanksgiving-to-Go. Place your order by 10:00 p.m., Monday, November 24, and then stop by on Thanksgiving Day to pick up your juicy, wood-fired, rotisserie-roasted turkey with all the trimmings, including sides, salads, bread and dessert. To make your reservation or to place your order, call Green Valley Grill at 336-854-2015 or visit greenvalleygrill.com. Thanksgiving & Christmas Dining:While Lucky 32 won’t be open, you can bring your clan to Green Valley Grill or Print Works Bistro.Their dining rooms will be open 12 noon-8 p.m. (with several turkey specials) and the bar will be open until 11 p.m. on Thanksgiving with the late night menu. To make your reservation, please contact Green Valley Grill at 336-854-2015 or greenvalleygrill.com and Print Works at 336-379-0699 or printworksbistro.com. plum fairies, toy soldiers and waltzing flowers inspired the special treats that will accompany your choice of tea, warm apple cider or hot chocolate. Afterwards each child can decorate an ornament and help our chefs make gingerbread houses; all accompanied by music and costumed characters. Afterwards, join Clara by the tree as she reads The Nutcracker. Bring your camera! Cost is $38 for adults and children, plus 20% service charge. Call Green Valley Grill at 336-854-2015 for reservations. Gift Certificates:You can order Quaintance-Weaver gift certificates that can be used at any of our businesses by going to qwrh.comor calling our Gift Certificate Hotline at 336-370-0966. We’ll put the gift certificates in the mail to you, or the fortunate recipient. Afternoon Tea 365 Days a Year!Enjoying afternoon tea in the social lobby of the O.Henry Hotel is extra special over the holidays because of the cheer in the air and because we offer some special seasonal teas and pastries. Call Green Valley Grill at 336-854-2015 for reservations. Group Celebrations:Bring your party to our restaurants or hotels for a festive celebration. We offer reservations, call-ahead seating and even a pre-ordering service that expedites service for larger parties. At Lucky 32,order from our full menu in our private and semi-private dining areas. At Lucky’s in Cary, we can handle up to 70 people in our semi private dining area! To enjoy the extraordinary food from Green Valley Grill or Print Works Bistroin the beautiful private event spaces of the O.Henry or the Proximity, please contact the hotels’ events team at 336-544-9604 (O.Henry) or 336-478-9111 (Proximity). We can host an intimate gathering of 15 or a bash for 150 (or anything in between). Get Lucky & PARTY!No time to prepare that covered dish? Let us cook for your office gathering or weekend party. You call, we cook, and we bring your order right to your car. For complete Get Lucky & Go menus,visit lucky32.com. New Years Day Menu:Make sure that 2009 is your luckiest year ever by joining us at Lucky 32for New Year’s Day. We’ll feature our full menu plus some “good luck” special selections like collard greens, roast pork and hoppin’ john. According to folklore, eating greens on New Year’s Day brings paper money, black-eyed peas bring coins, and pork brings good health. It seems like a good year to not take any chances so go for the good luck! O.Henry and Proximity Hotel Best Rates:Please visit our websites to get our “Best Rate”and save up to $70. In addition to our Best Rate, you’ll get a $30 Amenity Voucherwith a weekend stay (Friday, Saturday or Sunday night) from November 14 until December 14, 2008, and 7 days a week from December 14 until January 11, 2009 (except New Year’s Eve) with every room booked online at ohenryhotel.com or proximityhotel.com. 2009 for $209:Celebrate the arrival of the New Year at the O.Henry Hotel with priority reservations at Green Valley Grill on New Year’s Eve, champagne for a toast, and breakfast in bed for $209 plus tax. includes one night’s stay, a $30 gift certificate for Green Valley Grill, a $50 gift certificate for shopping, and a full hot breakfast buffet for $279 plus tax. 2009 for $209:Be a part of our first New Year’s Package at Proximity with priority reservations at Print Works Bistro on New Year’s Eve, sparkling wine to toast the New Year and breakfast in bed for $209 plus tax. Love Me Tender:Treat your sweetie to a romantic night in a Loft King Room with a Magi king bed, windows that allow abundant natural light, seating area, mini-cooler, microwave and a flat screen TV. In your room, enjoy house-made chocolate truffles, a bottle of wine or sparkling wine, a CD of romantic tunes, mood-setting turn down service and guaranteed reservations at Print Works Bistro, all for $269 plus tax. Overflow Family:If you live in the Triad and your house is getting a bit crowded with visitors, send them to the O.Henry or Proximity! We will pamper them and make them feel at home. Let us do some of the cooking. Remember to go to ohenryhotel.comor proximityhotel.com to get our Best Rate. Just give a call to make a lunch or dinner reservation at any of our restaurants. Please forgive us! We ran out of space for the recipe that we typically include. But, we have a great recipe for Date, Sage and Macadamia Nut Stuffed Turkey tenderloin that you can get at greenvalleygrill.com. 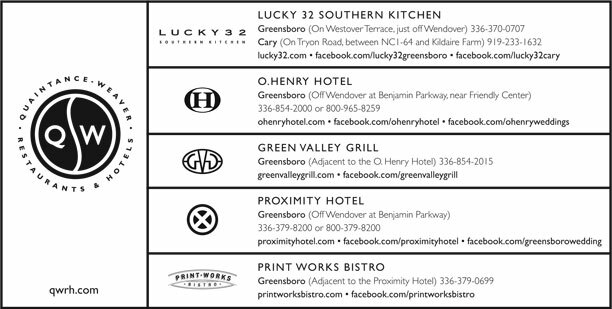 Visit lucky32.com, printworksbistro.com and greenvalleygrill.com for the current seasonal menus and the latest wine list. With larger parties we offer pre-ordering to expedite service so you have more time to enjoy your visit. Let us know when you make a reservation if you would like to pre-order. Just fax us your orders by 10:30 a.m. at lunch and 4:00 p.m. at dinner, and we’ll have your meals served within minutes of arriving. Call the restaurant (or go to one of our restaurant web sites) for a pre-order form.